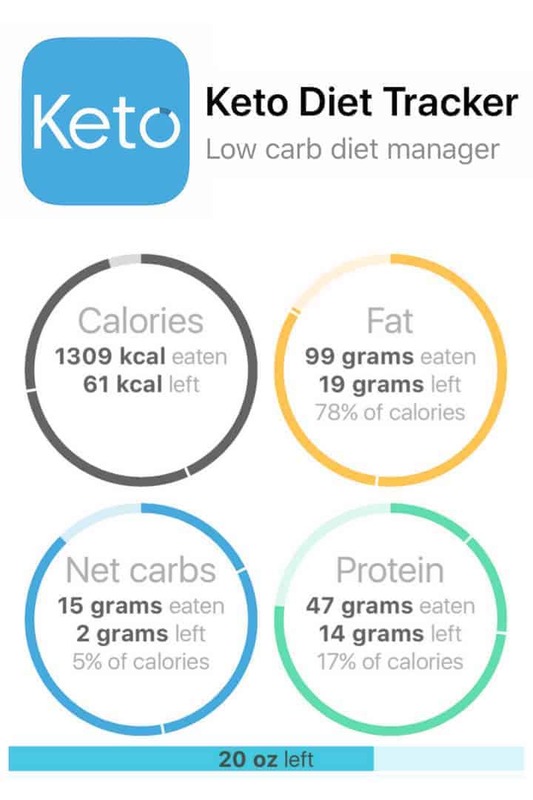 The Keto Diet Tracker low carb diet manager is one of the best apps for tracking daily macros on a ketogenic diet. And it’s more than a carb counter app for staying in ketosis. Disclaimer: This post has been sponsored by the Keto Diet Tracker. However, all opinions are my own. The keto diet is super popular these days, but you may be wondering how to stay on track day to day. The good news is there’s an app for that. But with several apps to choose from, it’s tough to decide which one will work best for you. 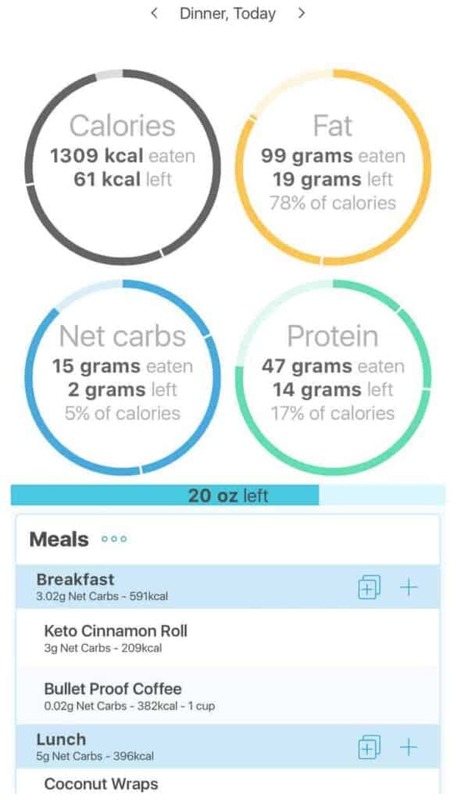 If you’re looking for a simple carb counter app to track your daily macros, I recommend giving the Keto Diet Tracker a try. It’s available from ke.to and I’m really loving it. 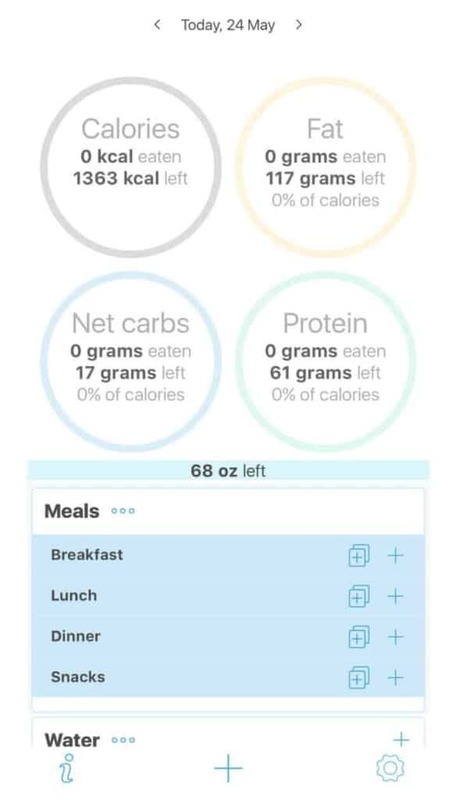 To begin using the app, you’ll need to set your nutrition goals using the built in calculator. These goals are based on your gender, weight, body fat percentage, and activity level. The daily macro goals also take into account whether you are trying to lose weight, maintain weight, or gain mass. I’ve got mine set for weight loss as I’m trying to lose the winter weight gain. Once you set your goals, you can start entering the foods that you’ve eaten or plan to eat for each day. The app will instantly update the amount of calories, fat, carbs, and protein for the day. This carb counter app does have the option to track either total carbs or net carbs. If you aren’t doing a strict keto diet, I find it’s best to count the net carbs as those are typically the ones that have the most impact. However, if you’re struggling to meet your weight goals, particularly if you aren’t seeing weight loss, you may want to switch the setting to track total carbs. That’s one of the awesome things about the Keto Diet Tracker app. Although it’s simple, it does allow some customizations to adjust setting to your own preferences. It’s super easy to enter in foods that you’ve eaten or plan to eat. 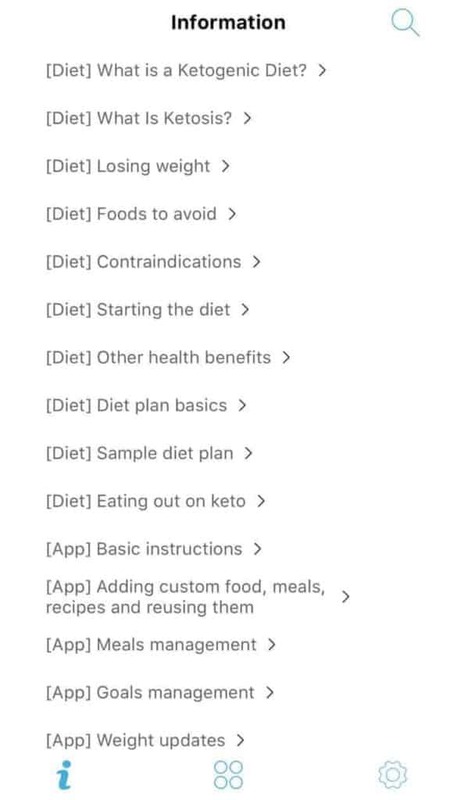 The app does include most of the items you’d find in a best keto foods list but anything not listed is quick and easy to save into the app. There’s tons of popular dishes from restaurants included in the database. You’ll also find packaged foods and popular keto foods like Bulletproof coffee. 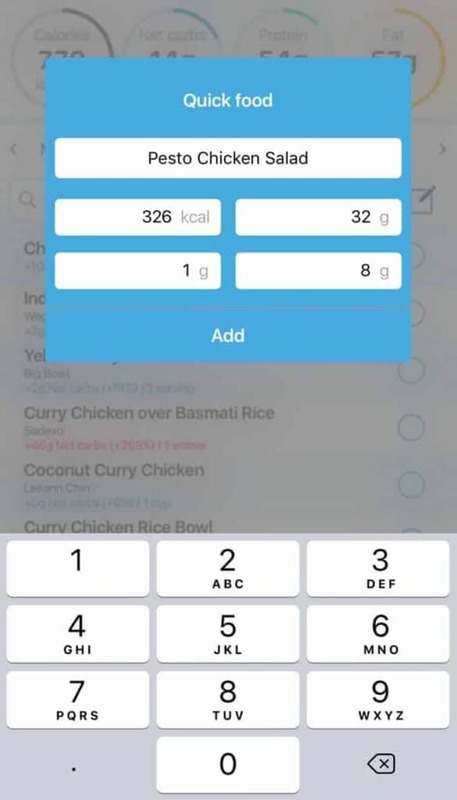 To grab a food item from the database in this carb counter app, you have two options. You can use either the search box or scan a barcode on packaged food. The bar code scanner is a very cool feature. And, if adding the food would cause your daily macros to be exceeded, the carb count is shown in red. Therefore, it’s a good idea to check the app BEFORE eating. 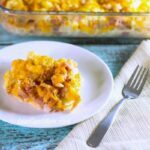 I think this is an awesome way to ensure you don’t exceed your daily carb count! In fact, I went back and entered in some of my regular eating habits and many exceeded the recommended macros for weight loss. No wonder I’m having so much trouble shedding those extra pounds. 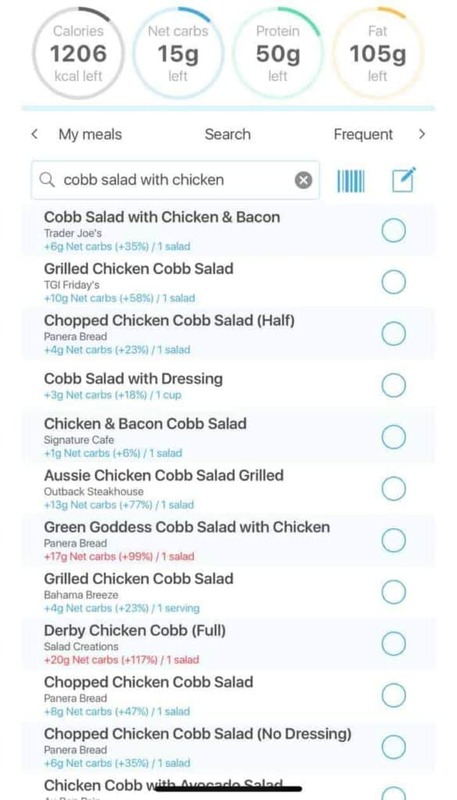 It’s also simple to add your own custom foods into the Keto Diet Tracker carb counter app. To do that, you’ll just hit the little pencil and notepad icon to use the “Quick Food” option. And, any quick foods that you add will be available to use again on your device using the search option. 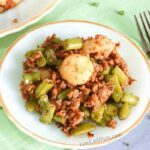 So, you’ll want to be sure to add all your favorite Low Carb Yum recipes! 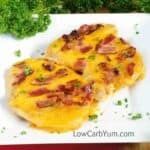 So if I wanted to add one of the amazing low carb bread recipes from a favorite keto website, I’d just type in the name of the recipe along with the calories, fat, carbs, and protein amounts per serving. Since I’m always testing out my own recipes, I find that this feature is a real time saver. All I have to do is plug my recipe into my nutritional calculator and enter the macros for a single serving into the Keto Diet Tracker app. Then, when I’m eating the leftovers, it’s a breeze to add that meal since the data is saved to my cell phone. It literally takes less than a minute to add a custom food item. 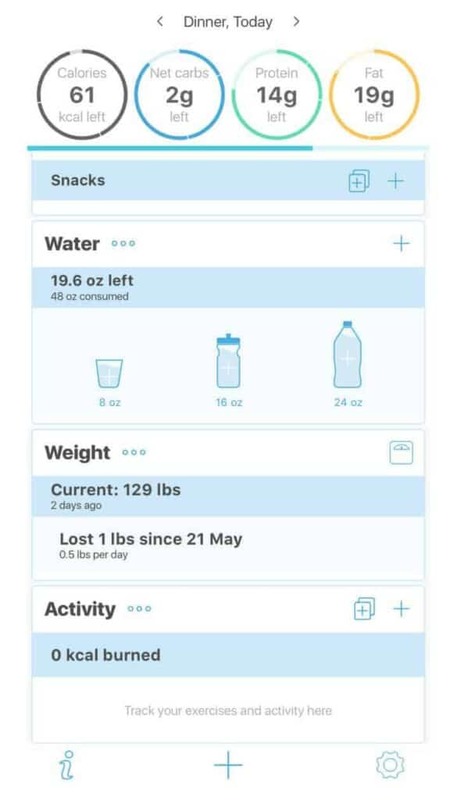 I also like that the Keto Diet Tracker let’s you track your water consumption, exercise, and weight with optional widgets. When I get busy, I’ll often forget about drinking adequate water during the day. So, the app is a fantastic way to get a constant reminder about consuming water throughout the day. Although weight does jump around, it’s good to keep an eye on it regularly so you don’t get too far off course. It’s not necessary to weigh every day so I like to enter that in weekly. And, I can get bad about sitting on the computer most of the day. That’s why I chose to use the optional activity tracker to help motive me to get moving. Once you get into the habit of using a carb counter app to track your daily macros, it will become a simple routine. I think the Keto Diet Tracker is an awesome way to track daily macros easily. I’ll admit that when I first started using the app, I had to play catch up for the day before. Unfortunately, I exceeded my goals and the app clearly pointed that out to me. That’s why I think it’s a good idea to plan out your meals ahead of time so you know before taking those first bites of food. The Keto Diet Tracker lets you quickly see what foods will keep you on track so you can make the right food choices during the day. 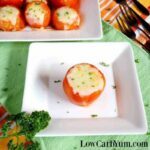 The app also has some useful information on the keto diet to help you get started if you’re a newbie. You’ll even find a sample weekly diet plan! And, the complete instructions for using the app are also listed. However, it’s such an easy program to use, you shouldn’t have to spend much time reading them. Even those who fumble with technology shouldn’t have any issues using this simple app. Just take it for test drive and see for yourself. 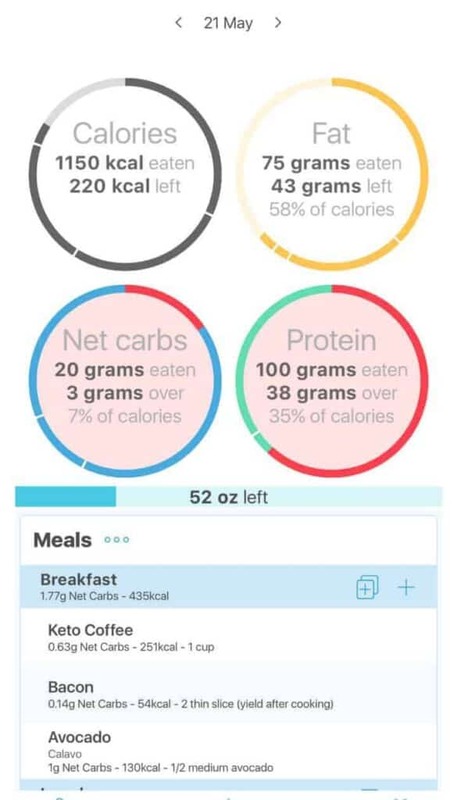 The “Keto Diet Tracker” app is available for both iOS and Android. It’s free to try, but you’ll need to buy the app to go beyond a few entries. Luckily, it’s very affordable. The best deal is to buy a 12 month subscription. You can learn more about the Keto Diet Tracker app at ke.to.